In April 1925 the USAAC issued a specification for a single-seat fighter to be powered by a new 447kW Packard engine of inverted layout. Boeing's airframe for this requirement was generally similar to that of the Model 15 family, but recognisable easily by an unusual feature/namely the incorporation of a coolant radiator in the centre-section of the lower wing. Designated XP-8 (Boeing Model 66), this failed to win a production contract. US Navy evaluation of the FB-4 with a Wright P-1 radial engine, which gave a benefits of these air-cooled powerplants, led to this aircraft being re-engined with a Pratt & Whitney Wasp. Redesignated FB-6, it was flight-tested exhaustively, and demonstrated the clear superiority of the Wasp, leading to a decision to combine this engine with an airframe based on the Model 66. 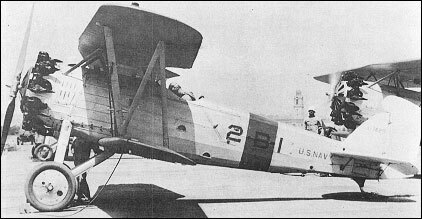 From this marriage of airframe and powerplant was produced the Boeing Model 69, designated XF2B-1 by the US Navy, and first flown in prototype form on 3 November 1926. It differed mainly in having the span of upper and lower wings more nearly equal, and by the propeller having a large spinner. Satisfactory testing of the prototype resulted in an order for 32 production aircraft under the designation F2B-1, with deliveries beginning on 30 January 1928, and these served with US Navy Squadrons VF-1B (fighter) and VB-2B (bomber) on board USS Saratoga. The F2B-1s differed from the prototype by deletion of the spinner, and introduction of a balanced rudder.